A single consumer profile isn't enough to accurately represent your entire audience. This wasn't as much of an issue in the days of traditional marketing, when targeting strategies were simpler, and publishing outlets far more broad in their audience reach. Today's brands, working within the digital marketing model, need to lean heavily on customer segmentation. The stakes are highest during the holiday shopping season, when consumers are urgently seeking out products, as brands compete for their business. Poor segmentation can undercut marketing efforts. It takes a range of demographics and other filters to identify strong prospects and accurately segment a consumer base. Location hasn't always been one of these filters, but brands can't afford to overlook it anymore. Here's a look at how GPS can increase ROI for your segmentation efforts. The concept of customer segmentation is simple: brands are able to sort their customers into several categories, with the understanding that each will require a unique approach. Consider the shopping population walking into a Walmart. They come for different products and with different motivations. They also have different approaches to decision-making, with some shoppers emphasizing cost above all else, while others examine quality or aesthetics more carefully. As Entrepreneur points out, these can all be used as measures to identify consumer segments. Similarly, location data plays a central role. GPS provides an additional layer of information on top of existing demographic information, revealing new, valuable insights. A study of UK consumers by Blis Media found that 39 percent of respondents were positively influenced to click on an ad based on location targeting. The behaviors of different consumer groups vary widely, and their location data offers prime insights into their areas of interest. Take, for example, a retail campaign targeting parents of young children. They spend time at soccer fields and rec centers, drive their kids to and from school, patronize family-friendly events and restaurants, and shop at stores specializing in children's products. Contrast that with a holiday campaign targeting college students. Untethered by kids, they tend to be out later at night and visit adult-centric venues. They shop at different stores, spend more time on university campuses, and typically reflect the behaviors of people with less money at their disposal. Some of these differences are evident through demographic data, but location information can make the contrast even more obvious, and offer key insights into what brands and products are most likely to draw the interests of this consumer group. Location data is only useful information if brands use it to interpret insights and identify relevance. Fast Company offers a few suggestions to make this work. For one, brands should research locations that may be relevant to a particular customer segment. 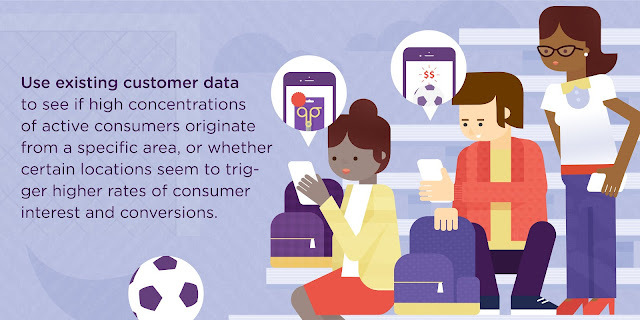 You can use existing customer data to see if high concentrations of active consumers originate from a specific area, or whether certain locations seem to trigger higher rates of consumer interest and conversions. A sports apparel company, for example, could target campaigns and segment customers according to who attends a particular sporting event at a designated venue—or to capture customers who haven't shopped in-store recently, they could create a customer segment of individuals who haven't been to the store within the past 60 days. This, in combination with demographic data, can aim to recapture consumers whose loyalty is flagging. It might also be worth targeting based on competitors' locations. Imagine Target running mobile ad campaigns focused on mobile users at Walmart stores. It's easy to see how that simple GPS data point could be used to redirect traffic back to Target stores. Ultimately, identifying locations is a mix of first-party data, third-party insights, and your own brand's intuition. With the holiday season spurring on changes in stresses and consumer behaviors, brands should be sure to build seasonal strategies that account for these shifts. It may take a couple seasons before you nail this strategy down, but whatever happens, just remember: When in doubt, turn to your data. GPS technology makes location data a valuable layer of filtering for customer segmentation. Holiday campaigns can use location data to run predictive campaigns and take direct aim at competitors. Brands should research relevant locations for each customer segment and build holiday-specific campaigns around relevant consumers visiting those locations.